Isabel Matute (at front), president of the Women Shoe Workers Association and Antonia Rico, a shoe worker, at her home. Photo: Rocío Ros Rebollo. All rights reserved.“If we stop, you don’t walk” is the arresting motto of the Women Shoe Workers Association (WSA) of Elche, a small city in south-eastern Spain. This group was established last year to expose two open secrets in the country’s so-called ‘Footwear Capital’: the lack of formal employment contracts and poor working conditions that many shoe workers in this area have endured for decades. Fifteen years ago, a study found that almost 9,000 people – about half of Elche’s shoe workers – were working without contracts, more than 7,300 of whom were women. Workers in the area say this situation has persisted. Without contracts, they’ve struggled to challenge exploitative working conditions and many work longer hours, for less than the minimum wage, without benefits. Women in this industry may work out of factories or their own homes, looking after kids and doing housework while sewing together parts of shoes. Their workday doesn’t end at a fixed time, but when orders are completed. “We usually do 50 or 55 hours per week”, Isabel Matute, 57, told me. “An hour for me can be [paid] even €1.5, €2 or €3 at most”, said WSA president, explaining that this adds up to less than €500 per month – which is less than half the legal minimum salary for a shoe worker in Spain (about €8 an hour in 2018, or just over €1,100 a month). Between the 1960s and 1980s, Elche’s population doubled from waves of workers migrating to the area, looking for jobs. Matute told me that she’d moved here from Andalusia decades ago to work in the shoe industry, which she’d seen as a great opportunity. “The highest aspiration for a woman, when you hadn’t studied because they had gotten you out of school to put you to work, was to be a shoe worker”, she said. Today this industry includes small local businesses as well as subsidiaries of multinational companies. Tempe, for example, is based here. It produces shoes for brands like Zara and Pull & Bear, and is part of the Inditex empire owned by Amancio Ortega, the world’s sixth richest man according to Forbes. In 2016, the footwear industry in Valencia made €418 million from exports. Some of the local businesses are also very large. The local company Cuplé, for example, had a turnover of almost €30 million in 2017. Too little of this wealth has trickled down, according to the shoe workers organising in the area. Matute knows the names of the brands whose supply chains she worked in, but doesn’t want to share them. None of the shoe workers I interviewed would disclose these in fear that companies may stop producing shoes in Elche. Their goal is rather to demand this industry provides contracts and better conditions. Another WSA member, Antonia Rico, 58, told me that several years ago she’d worked at a factory where, “on my way home during my lunch break I used to sit there in the corner to cry for a while so that my husband wouldn’t see me cry, and I’d think, ‘Oh my God, I have to come back at three again’”. She now works from a room at her home where she has three sewing machines bought over the years. On shelves, she keeps gasoline to clean the machines and toxic glue, which can cause paralysis, to stick shoe pieces together. Antonia Rico sewing a shoe at her home. Photo: Rocío Ros Rebollo. All rights reserved.The big brands selling shoes made in Elche haven’t publicly commented on the workers' allegations though local industry groups have. 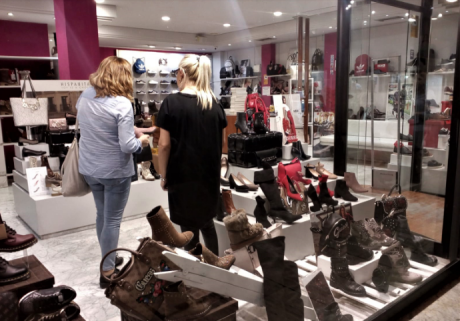 Marián Cano, president of Valencia’s Footwear Businessmen Association said that “particular cases that have been reported shouldn’t stigmatise the whole sector”. The WSA’s most pressing concern is the future of its members close to retirement age. Without legal contracts and on extremely-low wages, they have been unable to pay into state pensions and many face the minimum payments of just €380 per month – even lower than the salaries they struggle to live on. “I have worked for 42 years”, said Matute, for example, “but I have only been able to contribute [to the state pension] for six”. The WSA are demanding the state cover them for the years they were not able to make these payments. But the Socialist Party that governs Valencia has said this is complicated. “They suggest a sort of amnesty, but from which year would this begin? There are shoe workers of different ages, some have signed short-term contracts, some part-time contracts, others have none at all”, said Toñi Serna, a party deputy. The shoe workers’ campaigns have pushed the national government to review ways to support them economically during retirement. In late 2018 the Valencian parliament unanimously approved a proposal, presented by Serna, to request the state find an appropriate formula to do this. This request is now with the national government. Matute said she doesn’t care how it happens, but she knows she doesn’t want “a donation, a pittance, but a decent pension, because they got rich”, referring Elche’s shoe-driven boom. A shoe shop in Elche. Photo: Rocío Ros Rebollo. All rights reserved.In response to these workers’ claims about lacking employment contracts, the CCOO trade union federation and Serna, at Valencia's Socialist Party, said they should report specific employers to the police for investigation. Though there are reasons workers may not do this – including fears of being ‘blacklisted’ by employers, or accused of 'benefit fraud' if they claimed unemployment benefits while working without contracts, on very low wages. Aside from state pensions, the WSA workers are also demanding that the physical and mental impacts of their work be officially recognised as ‘occupational illnesses’. That, combined with formal contracts, would allow these women to ask for sick leave and access related social benefits. Las Kellys, an association of women hotel cleaners that inspired the shoe workers, succeeded in obtaining official recognition of such work-related illnesses last year. The senate also agreed to consider these issues as part of an inquiry into the footwear industry that is understood to be ongoing. As in the hotel business, outsourcing is widespread in this industry. The vast majority of women shoe workers in Elche work for subcontractors that supply bigger companies and brands. The WSA also aims to challenge this system. Last year, two new associations of shoe workers were also formed in the nearby city of Villena and the area of Vega baja. Together with the group in Elche, these associations have more than 300 members – and a plan to create a women’s cooperative to collectively negotiate terms with employers. Through their organising, these women are sharing their experiences, and supporting each other. When they meet, they learn that many worked at factories in the area and left feeling “humiliated” and “despised” by their bosses, said Matute. “Women slaves exist in 21st century Europe, in Elche”.